Party bags for the under 3's can be hard to come by, because party bag fillers, by their nature are usually small items, and are therefore only suitable for children over the age of 3. 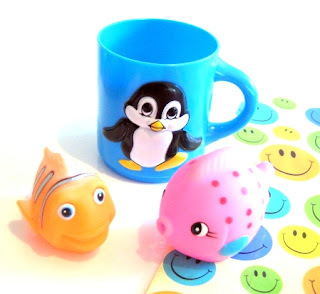 For a while we've stocked bath themed toddler party bags, consisting of a plastic mug (dolphin, penguin or seal) filled with 1 or 2 squeezy bath fish. We've recently been asked by customers if we can do the bath filled party bag with other kinds of mugs, for example, lion or tiger....and as there's no reason why not, we've expanded the range to include all our animal mugs, and renamed the product Toddler Party Bag. The squeezy fish are suitable for babies over 3 months of age and the mugs are for children aged 2 and above. If you are looking for party bags for babies, you can buy a filled party bag with the squeezy fish only.